An art installation honouring survivors of residential schools is being recognized as a "living entity" in an agreement combining Indigenous teachings and Western law. The Canadian Museum for Human Rights and First Nations artist Carey Newman are signing an agreement Friday to be joint stewards of the "The Witness Blanket," which is comprised of more than 800 items collected from the sites and survivors of residential schools. Newman, a Kwagiulth and Coast Salish artist from Vancouver Island, said he has never felt ownership of the 12-metre-long installation, but rather a responsibility to honour the survivors' stories it carries. In devising a way to share this responsibility with the CMHR, Newman said he and the Crown-owned museum came to an "unprecedented" agreement that would vest legal rights with the artwork itself, rather than treating it like a transfer of property. "It's a Crown corporation really following through on the idea of being Indigenous-led, of reconciliation," Newman said in an interview as he arrived in Winnipeg on Thursday for the signing. "By putting the rights with the work, and putting responsibilities with ourselves, we've become collaborators trying to figure out our way forward." Heather Bidzinski, the CMHR's head of collections, said the museum will care for "The Witness Blanket" working in co-operation with Newman to ensure the artwork's rights are being respected in keeping with Indigenous cultural practices. The stewardship agreement will be ratified both in written documents and an oral ceremony to be held near Newman's home territory of Kwakwaka'wakw at a traditional feast later this year. The son of a residential school survivor, Newman said in the process of creating "The Witness Blanket," he feels he has only scratched the surface of understanding reconciliation and decolonization. But he sees the agreement as an embodiment of what it will take to realize those goals, and said he hopes other institutions will follow the CMHR's example in recognizing land not as something to be owned, but looked after for future generations. "I started this journey because of my father," he said. "I continue it because of my daughter." 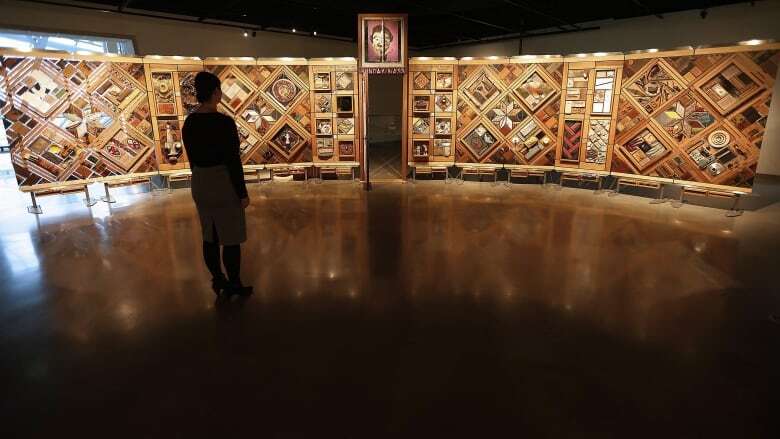 The CMHR said "The Witness Blanket" needs restoration work, but a travelling version will be shown at the Red Deer Museum and Art Gallery in Alberta from May 4 to June 23.